In the past 10 years there have been a number of bubbles that went pop. Many speculators lost their money and a lot of innocent investors got caught up in the turmoil and lost their hard earned money. That is why I caution folks not to get caught up in any risky obsessions that can lead to big falls in the value of their investments. At the beginning of the decade it was a Dot com boom and bust bubble. A few years later it was the housing boom and bust bubble. Next came the oil boom and bust bubble. Then a stock market boom and bust bubble. And now gold is behaving in the same irrational manner. For 5000 years gold has been mined and used for jewelry and a valuable metal that will always have some value attached to it. None of it has disappeared and every year more is mined. There is estimated to be 168,000 tonnes of gold on the surface of earth. Do the maths, there are 32,000 ounces in a ton, then times that by 1200. I make that $6,451,200,000,000 ... That is a big number and since most folks can hardly keep up with their credit card payments gold may be the most overvalued commodity in the world right now. Another good reason not to own gold is that if you go out wearing gold jewelry with such a high price tag on it, you stand a good chance of being mugged. From a high point of $800 in 1980, gold traded lower for twenty years and was one of the worst investments as it fell to $255 an ounce in 2000. Since 2000 gold has risen to $1230 an ounce, so anyone who has been in it for that ride has done very well indeed and gold is their friend. However, a profit is only a profit when it is realized and if it stays on the books and falls then it is not a profit. The signs of a market top is when the media become obsessed by any given investment and it hits headline news on a daily basis. On most financial channels and newspapers, many experts will express their view why gold is going higher. One reason was because the dollar was weak. Now it is because the Euro is weak. Yet again one expert will say gold is going up because we are in a deflationary phase and interest rates are low. Another expert will declare, gold is going higher because inflation will soon become a major threat. 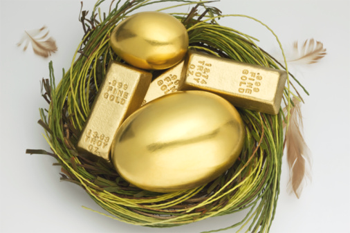 A guest expert recently maintained the high price of gold indicates no confidence in the Obama Government. Another asserted the Euro zone will fall apart very soon. Another stated China is heading for hyper inflation. So much intellectual propaganda is derived from outdated fallacies and myths. The fact of the matter is, when the media fixes its sights on any target the theme is hammered, pummeled, pounded by experts until all the hype and sensationalized reports sends the investment into a gyrating tailspin or inflated bubble. When the taxi driver and the barber tell you it is time to invest in gold you know it is time to get out if you are in any gold related investment. If we read the headlines over the past two hundred years, which included two world wars, the fear factor was always present in one way or another. Their will always be some reason why a group of hedge funds or other vested interested parties will want to pump up the price of a stock or commodity or take it down. In a free market, people are free to exploit every legal loophole to better their cause. Peter Pans Never Never Land to devalue their currency...Gold soars. People everywhere are selling gold jewelry to be melted down and made into a Golden Calf ... Holy Cow! ... Gold soars. Hype, sensationalized reporting and fear mongering speculation takes away the supply/demand ratio and replaces it with ... P-erceptions, I-deas, T-houghts, S-uggestions that people assemble for one good or bad reason or another. Thus, most speculators who cannot find truth in investments are left in the "PITS". Most will lose money in the long haul of speculation without a truthful foundation, so for them gold may become their foe. There is a time to sow and a time to reap and nobody went broke taking a profit. One of my golden rules on investments is... buy low and sell too soon.